A day without so many to-dos would make me a better blogger and plant parent. These babies should’ve been brought in long ago (and the peach tree should’ve been pruned and the tomato stakes taken down and etc. and etc. ), but a garden is nothing if not process. It looks like I rescued everyone in time. Now to see if they are peaceful, indoor creatures. 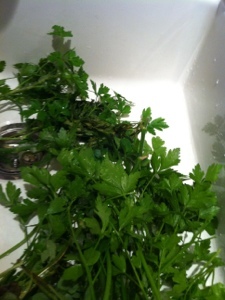 My parsley was doing beyond great but I had only the option of whacking at it to get the goods since I have neither room nor desire to let it overwinter indoors, and I didn’t want to waste it. A heavily parsleyed Italian wedding soup ended up on my stove tonight. Finding a home. 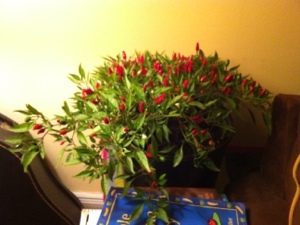 This is a Thai chile pepper plant and I have 100% no idea how it will fare indoors. It’s new to me this year, one of three. I like heat in my meals but not enough to keep this happily harvested. All the gang together before going their separate ways. The white on the strawberry plant toward the back is snow, unfortunately, not flowers. The leaves are said to make a nice tea but this bugger gave me no more than one stingy little berry. I’m hoping it will winter indoors ok and then plant it and let it spread in the spring. Spring. Feels soooo far away. 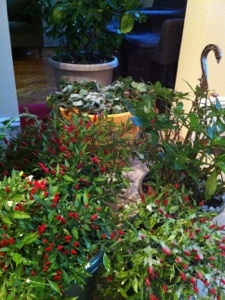 This time of year brings a lot of plant shuffling. A number get to overwinter inside, but similar to nature there is no free ride. 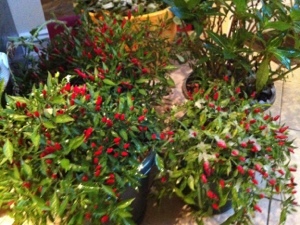 A selection of plants come inside, but then the struggle for limited sunlight, adjusting to the warm dry winter air, and my not always regular watering schedule begins a new struggle to survive until spring. Inevitably one or two plants succumb to the changes, but like the yard, something always fills the void. Each year even this gets improved upon. Certain plants go to the same spots they did well in last year, and some get constantly moved to get more sun. One change is my bamboo. This will be it’s first winter outside. There’s been a number of yellowed leaves but it may just be it’s adjusting to the weather. It survived Sandy so it should be OK.